This cake by Lulu Cake Boutique is a show-stopper! They are my favorite cake boutique for good reason. We are asked every year to photograph the Best of Westchester event that is held at Glen Island Harbour Club. We have done that for several years running now. Each year, we notice Lulu Cake Boutique there. It's hard not to notice, as there is always a crowd of people clamoring for a bite! Of course, we taste cake first with our eyes. This is one area where Lulu just shines. Her cakes are always almost too pretty to eat! She is so creative, and her designs are always sheer perfection. 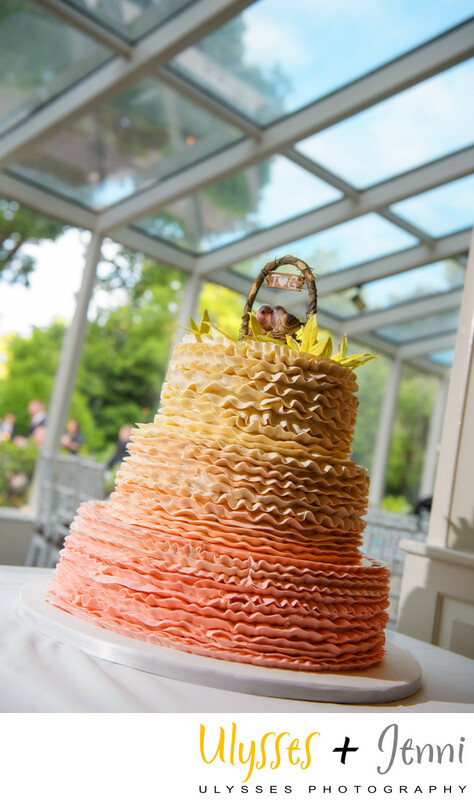 This ombre cake in oranges and yellows with the lovebird topper is one of the prettiest I've seen. The multiple ruffled layers are so fresh and clever. You can't fully appreciate a cake without tasting it, and thankfully Lulu doesn't disappoint. Hers are the tastiest, most delicious cakes ever. And I'm not even a cake person! When I hear Lulu is making the cake, I know it will be worth an extra hour or two on the treadmill. Keywords: brownies (12), cookies (12), Crabtree's Kittle House (15), DIY (12), English garden (12), Spring (102), Teryn + Greg (18), wedding (528).